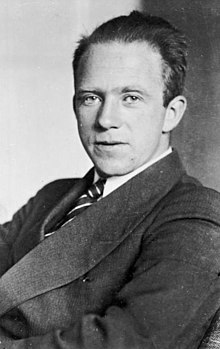 Werner Karl Heisenberg (German: [ˈhaɪzənbɛɐ̯g]; 5 December 1901 – 1 Februar 1976) wis a German theoretical pheesicist an ane o the key pioneers o quantum mechanics. ↑ Mott, Nevill; Peierls, Rudolf (1977). "Werner Heisenberg 5 December 1901 -- 1 February 1976". Biographical Memoirs of Fellows of the Royal Society. Royal Society. 23. doi:10.1098/rsbm.1977.0009.